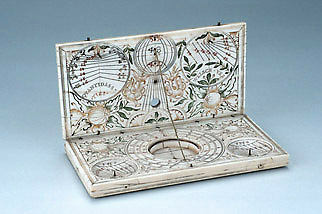 This dial is unusually wide, and finely decorated with fruits and flowers. The small scaphe dials indicate Italian hours (or 'Welsch hour') and 'Penmische' hours - probably another name for the same system of hours. On the outer part of both leaves is the same decoration with two full figures.